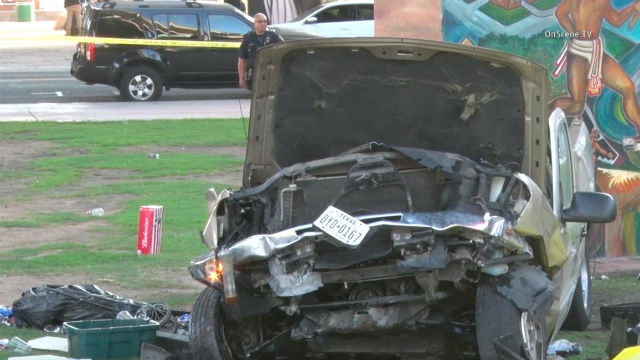 The truck plunged into a crowd of festival-goers in Chicano Park. Photo Credit: On Scene TV. A Navy petty officer accused of driving drunk on a transition ramp to the San Diego-Coronado Bridge and plummeting over the side and into Chicano Park below, killing four people, “decided to drive irritated, impaired and impatient,” leading to the crash, a prosecutor said Wednesday. As his closing argument began, defense attorney Paul Pfingst said multiple breath and blood tests showed that Sepolio was not under the influence of alcohol the day of the crash. One blood sample was taken to a California Highway Patrol office and wasn’t tested for a year, Pfingst told the jury. “They took his blood and they destroyed it … and they say it’s no big deal,” the defense attorney said. Sepolio testified he was driving on the transition ramp — a route back to Coronado that he had driven more than 90 times before — when he sped up to merge in front of another car and lost control. Sepolio said he remembered being on top of a freeway barrier looking down, then waking up in the park and being pulled out of his truck. The defendant denied arguing with his then-girlfriend on the phone just before the crash. Sepolio said his memory was mostly “cloudy” about what happened after his truck plunged into the crowd below. Sepolio testified he had a glass of alcoholic cider and a glass of wine at lunch before heading back to Coronado. Closing arguments will conclude Thursday, then jurors are expected to begin deliberations. Sepolio faces at least 23 years and eight months in prison if convicted of all charges.